“Transition to Christianity”: Art of Late Antiquity 3rd to 7th Century A.D.
New York.- The vibrant and complex life of the Eastern Mediterranean during a time of reinvention and renewal will be the subject of a major new exhibition at the Onassis Cultural Center in Midtown Manhattan. 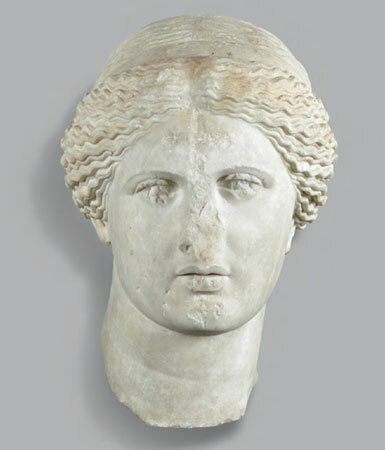 On view from December 7, 2011 through May 14, 2012, Transition to Christianity: Art of Late Antiquity, 3rd – 7th Century A.D. will bring together more than 170 exceptional objects on loan from Greek museums, as well as museums in Cyprus and the United States. Incorporating many outstanding works of art that have never before been seen outside Greece, as well as recently discovered works that are being exhibited for the first time anywhere, Transition to Christianity reveals a period of extraordinary and perhaps unexpected creativity in the Greek world of Late Antiquity. 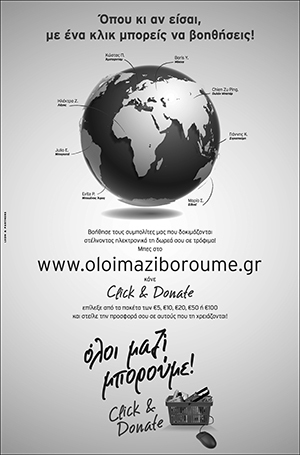 The exhibition is jointly organized by the Onassis Foundation (USA) and the Byzantine and Christian Museum, Athens, with the scholarly support of a distinguished advisory committee from the Program in Hellenic Studies at Princeton University. Curators of the exhibition are Dr. Eugenia Chalkia, Director, Byzantine and Christian Museum, and Dr. Anastasia Lazaridou, Vice-Director, Byzantine and Christian Museum. Serving on the advisory committee are Peter Brown, Professor of History, Emeritus; Slobodan Ćurčić, Professor of Art and Archaeology, Emeritus; and Dimitri Gondicas, Executive Director, Program in Hellenic Studies, Princeton University. The extraordinary objects in the exhibition represent a wide range of media and functions: mosaics, paintings, sculptures, architectural elements, inscriptions, coins, liturgical objects, jewelry and domestic furnishings. Together, they reveal the creative ferment of the world of Late Antiquity, when a new society, religion and material culture were gradually replacing the old. The first section, The End of Antiquity? Cultural and Religious Interactions, bears witness to the survival of the ancient Greek and Roman forms of worship and the mystery cults in the 3rd and 4th centuries, and to Christianity’s rise within this cultural milieu. Statues from house shrines document the continuation of paganism well into the 6th century, when it survived as part of the culture of the social elite. Meanwhile, Christianity adapted and incorporated existing artistic forms and subjects. The image of the philosopher, for example, with his profound gaze and intense features, became the model that Christians used to depict the apostles. The second section, Christianity on the Rise: From Recognition to Authority, surveys the effects of Emperor Constantine the Great’s recognition of Christianity and policy of building magnificent churches in the empire’s great urban centers. Images on coins testify to the merger of imperial and Christian imagery. In this medium, the Christian emperors borrowed imagery from past examples, redeployed them for a new message of Christian triumph. The third section, Urban Realities, focuses on the gradual changes in city life as the important centers of the Greco-Roman world became Christianized. Architectural inscriptions show the worldly influence of bishops, who were usually of high social status with classical educations. Consular diptychs made of ivory announced appointments of individuals to new government posts and invited important citizens to the Hippodrome for games hosted by the official. Richly carved architectural elements, mosaics and portrait busts reflect the status of a new class of officials and city dwellers. Hordes of coins and the famous Mytilene Treasure bear witness both to the wealth of cities and to the continual threat of invasion and looting. The fourth section, Daily Life, presents objects relating to the public entertainments in the Hippodrome (which supplanted the banned Olympic games); wedding rings, which reflect the gradual Christianization of the institution of marriage; and ornaments that testify to the continuing desire for personal beauty in a society that was turning more and more toward the other world. A variety of amulets and charms with magic symbols believed to ward off demons and protect against the evil eye show the prevalence of syncretic, popular beliefs—although the symbol of the cross or the image of a guardian saint became increasingly ubiquitous in ornamentation used for personal protection. After Christians were granted the freedom to worship openly, churches rose across the Empire. In the section Early Christian Worship, architectural elements and examples of church furniture demonstrate appropriation and modification of old forms for new religious needs. Together with adaptation of old building types for new functions-the basilica (based on the Roman secular building type), and the centrally planned church (based on late Roman mausoleums)-these objects collectively demonstrate the process of transformation. The sixth section, Death and New Life, reflects the profound inner change brought about by Christianity, as people began to think of earthly death as the beginning of an eternal heavenly existence. Besides examining Christian burial practices of this time, the exhibition will display objects that testify to the Christian belief in the miraculous powers of martyrs and saints. On view will be reliquaries and mosaics that illustrate the rise and spread of the cult of saints, and pendants and pilgrims’ tokens highlighting the phenomenon of pilgrimage to martyria. Finally, The Genesis of Christian Art will examine the emergence of Christian visual language in Late Antiquity. It is in the funerary context that most evidence of the earliest Christian art has been preserved. The symbols that held exclusive meaning for the new religion—the cross, the Chi-rho and the fish—were eventually joined by a broader repertoire of figurative art. Glass, paintings, and sculpted reliefs shared motifs and iconographic formulas of pagan art, but adapted these to a new Christian context. Christianity’s ultimate triumph over paganism led to an increasing readiness to appropriate aspects of ancient art for its own purposes. This last section will examine how certain pagan forms and ideas became integral in the new Christian art. Perhaps the most ubiquitous among pagan art forms, the portrait, was gradually replaced by its two-dimensional Christian counterpart, the icon (depicting Christ, apostles, martyrs and saints), whose representational value was commonly accompanied by miraculous powers possessed by the image itself. The exhibition closes with three of the famous David Plates, part of a set of nine splendid silver plates produced in the 7th century that were discovered on Cyprus. The plates constitute a climactic synthesis of the art of Late Antiquity. Illustrating episodes from the Old Testament’s narrative of the life of King David, the plates were produced under the auspices of Emperor Heraklios, whose victory over the Persians was metaphorically celebrated through the representation of David’s defeat of Goliath. The plates clearly reveal a late survival of classical style and iconography in the service of a Christian Emperor, whose role, according to Christian ideology, was associated with the role of a Heavenly Ruler, Christ, directly descended from the House of David. The exhibition will be accompanied by a fully illustrated catalogue published by the Onassis Foundation (USA). The contributions, by leading scholars of Late Antiquity, will include an introductory essay by Peter Brown, and essays by Jaś Elsner, Dame Averil Cameron, Helen Saradi-Mendelovici, Ioannis Touratsoglou, Henry Maguire, Aristotelis Mentzos, Kimberly Bowes, Fabrizio Bisconti, Katherine Marsengill and Slobodan Ćurčić. Throughout the course of the exhibition, the Onassis Cultural Center will provide free guided tours and gallery talks by scholars specializing in the subject matter of Transition to Christianity. Comprehensive brochures will be distributed at no cost to visitors, and an e-learning program will be made available at www.onassisusa.org. At a later date, the Onassis Cultural Center will announce lectures and a conference organized in conjunction with the exhibition. The exhibition Transition to Christianity: Art of Late Antiquity, 3rd-7th Century A.D., the exhibition catalogue and the public programs are funded in their entirety by the Onassis Foundation (USA). General coordination and supervision are given by Amalia Cosmetatou, Director of Cultural Affairs, Onassis Foundation (USA). The Onassis Cultural Center is open to the public Monday through Saturday, 10 am to 6 pm, except Christmas and New Year’s Day. Admission is free.